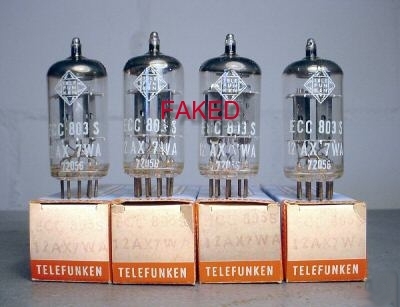 Those tubes that everybody is looking for, are generally NOT for sale in new boxes, in high quantities, for low prices by a new and unknown seller in a far away country, with lot's of positive feedback. Sometimes yes, but most of the time not. If you have this strange feeling not to trust it, the OBVIOUS things will not help you. So of course, the optics is nice, and of course he ships sooo fast, and he is such a nice person. Better is when he writes he accepts return shipments. A good technician can not be fooled with the electrical data coming from a parametric tube tester, such as the Russian L3-3, but you have zero chances with a Hickock or any other "quick" tester. Balancing. Double triodes that are balanced by default, like ECC801S 802S and 803S, should of course not come out of the box unbalanced. The "feel" of real old glass which has never been heated since 60 years. I don't know why, but the glass surface gets a typical feeling from decades of storage. It is a bit "oily" feeling, though it is not oil of course. You can polish this off with a cloth, but then it is gone of course. Also it disappears after heating up the tubes for the first time. Particularly this oily feeling develops nicely in a colder room. So when I spot this "feeling" I know it is real NOS. The smell (1). Use your nose it really a good thing :) This is working nice with tube testers that can heat up the tube under full dissipation. Like again the L3-3, and not like a Hickok or even lower class testers. Whatever this curious layer is, it evaporates directly at the first heat up. So I set the tube to maximum dissipation, and while it heats up, you try to smell it. For 1 half a minute the tube produces an "old" smell. You don't need a nose like a police dog for that. Just smell a tube that is really NOS, never switched on before, and it produces a smell sample like "old paper" or like a "humid basement". The smell is extremely typical, but of course it comes only once and only for seconds. After you evaporated that layer, it is gone, also the oily feeling is gone. Sometimes there is a flash of vinegar smell when the glass heats up first time after 50 years. The smell (2). There is the smell of a tube box from the 1950's, it is definitely another one as from the 1980's. Paper detoriates over time a lot, and the smell of that detoriation is characteristic for me. Do it like this: Remove the tube, and then breath slowly inside the box via your nose. Simply slowly and just five seconds. This will put some warm and some humid air in the box. Then with your nose still on the box, sniff in this air but not slowly. Sniff it in short and fast. You will smell how if the boxes are really old, and if so how they were stored. You need to practice a little bit with that. Quickly you will learn to keep apart old and re-printed boxes with 100% precision. Even you can say how they were stored: Dry or humid. If stored dry, the small has a flash of vanilla or fresh wood, call it a good smell. If stored humid, the smell is more like old stones, like an old basement. If there was fungus in the storage room, you can learn to recognize too. As I said, you need some practice, comparing many boxes, but this is really good, hidden information, and impossible to fake. The print. By storage, the print is often softened, which effects disappears after first heating. The pins (1) . I learned this from al old lady, whose husband was in tube re branding for decades. She could often recognize a tube brand by the feel of the pins. I find this difficult. Perhaps my fingers are too thick for that, but the lady was really good it it. I do know how RFT tube pins feel on my thumb. They are scratchy, and the feeling is unique. So I can spot any RFT blind, no matter what they print on the glass. The pins (2) .TESLA E88CC Gold pin have often a somewhat smaller pin diameter. My guess is, they removed some of the surface with acid, and then gold plated them. At last but not least, the human factor. Perhaps I know which of my suppliers I can trust, and which needs more control, but generally this the most unreliable of all other methods. That is why I put it at the end.